The Shoop Ranch is a remarkable property with live water and a lot of character just north of Fort Worth. It is a large predevelopment opportunity with a prime location in the heart of one of the nations fastest growing economies over the next five years. The Shoop Ranch is north of the Alliance Airport and between Decatur and Denton. Whether it is an immediate development play or a strategic hold for the near future is up to the land investor. Location: The Shoop Ranch is north of the Alliance Airport and north of State Highway 114, between Decatur and Denton. It is within the New Fairview city limits. The land is accessed primarily from FM 407 between New Fairview and Justin, and it also has access from county roads on the north and east sides. The property is approximately 15 miles from Deactur, 20 miles from Denton, 30 miles from Fort Worth, and 45 miles from Dallas. There are several nearby residential developments well underway that include Harvest, Highlands, and Avery. Water: The ranch has over 1.5 miles of both sides of Oliver Creek, which is a stunning clear water creek that runs all year long. It has limestone bottoms and is covered with fossils and long stretches of fishable water with bass, perch, and carp. Oliver Creek has several small unidentified tributaries that branch out towards the northern portion of the property. There are about 12 stock tanks scattered throughout the ranch for livestock, and the largest is about 1.5 acres in size. The ranch is being offered with approximately 50 acre-feet per year of adjudicated, deeded water rights out of Oliver Creek, which is part of the Upper Trinity River Segment of the Trinity River basin. This permit authorizes the landowner to divert, impound, and irrigate at 1,000 gpm from of an existing 5 acre reservoir. There are 2 water wells that produce from the Trinity Aquifer: a 6.25 domestic well in Denton County that was drilled in 1977 to 400, and a 7 domestic well in Wise County that was drilled in 1997 to 500. These yield approximately 15 gpm. Topography: The Shoop Ranch has primarily gentle rolling terrain, with most of it in pasture, and some cultivation. There are wooded areas along the Oliver Creek basin and also on the edges of about 3 or 4 wet weather tributaries. Bisected by Oliver Creek in the northern part, the ranch has over 150 of topographical change, with elevations ranging from 720 to 870. The ranch generally drains from south to north, into Oliver Creek. The highest points in the property are located in the southwest and the lowest points are located in the northeast. 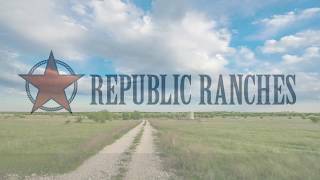 Wildlife: The Shoop Ranch has abundant wildlife with plenty of whitetailed-deer, varmints, and an occasional Rio Grande turkey. Dove hunting is also good around the cultivated areas. Soils: The soils on the ranch consist of primarily the somervell-aledo complex, aledo, and sanger clays. See soil map for details. Minerals: There is gas production, and a good caliche road base system throughout the property. Minerals are not available with this sale. The ranch is located within two school districts, the Decatur Independent School District on the west side and also the Northwest Independent School District on the south and east sides. This property is 100% contiguous, and is not divided by any streets or roads, as may appear on some online maps. The owners have expressed an interest in retaining the farmhouse and surrounding 10 acres if it is not essential to the acquisition. Preliminary plat is submitted to the City Secretary. Plat goes through review process until approved by City Staff. Preliminary plat goes through City Council for approval. After preliminary plat is approved by City Council, construction documents and a Final Plat are submitted to City Secretary. Both items go through a review process until approved by City. Final plat is recommended for approval by City Council. Surety of Construction is provided. City Council approves Construction Documents. City Council also approves Final Plat but does not sign plat until construction is completed. Preconstruction Meeting is held with City Staff and Council. Final project inspection, then record drawing submittal. Surety for maintenance is provided. City accepts improvements and Final Plat is Signed and Filed. Due to the size of the subject property, the City of New Fairview will recommend submitting a Master Development Plan of the entire subject property prior to the preliminary plat submittal. The subject property is currently within the Agricultural Zoning District A , which requires a minimum lot size of 2 acres. A zoning change will be required. The City of New Fairviews Comprehensive Plan states that the majority of future development will be dedicated to low density residential uses. Higher residential developments are not prohibited, but a planned development district would be required. Planned Development Districts (PD) are allowed in the City of New Fairview as a way to deviate from existing zoning district requirements. A development plan must be submitted as part of the PD application and any restrictions represented in the development plan will become part of the ordinance once the zoning change is approved by City Council. If for some reason the development plan is to be changed after approval, an amendment to the development plan must be submitted and approved by the Council. The Single-Family zoning district permits a minimum lot size of 1 Acre and a maximum density of 1 dwelling unit per 2 acres. The City of New Fairviews Thoroughfare Plan was provided as part of a comprehensive plan, which shows FM 407 (south of the subject) expanding to a undivided 4-lane principal arterial (P4U). FM 407 is currently an east-to-west 2-lane undivided collector (C2U). The proposed land use plan also proposes County Line Rd as a 4-lane undivided minor arterial (M4U). County Line Rd. currently is a smaller 2-lane road that runs North to south along the Wise and Denton county lines. The Future Land Use Plan identifies a 2-lane undivided collector (C2U) to be constructed parallel to FM 407. It will connect FM 2264 and County Line Road and provide access to the Highland Meadows subdivision to the west of the subject property. The City of New Fairview will be unable to provide water for the property because there is no current infrastructure in place to support development. Only a very small part the southern portion of the subject property is within the CCN Boundary of Aqua Texas, which has provided well water to the Highland Meadows subdivision, directly west of the property as well as to Kings Rest Estates, Diamond Ridge Subdivision and the Old Chisholm Estates to the south of the property. All neighboring systems utilize well water, and have separate distribution systems. The City of New Fairview does not have a water plant, and the nearest Aqua Texas treatment facility is in Justin. All developments in New Fairview utilize septic systems for wastewater service, and minimum size of lots for septic use is 12 acre in Wise County and 1 acre in Denton County.